March 29th, 2018 By: GGT Category: 2018/10 release, Figure News. 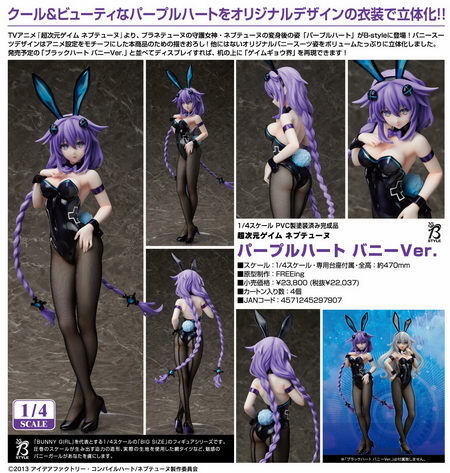 FREEing is going to release the B-style Purple Heart ( パープルハート ) Bunny Ver. ( バニーVer.) 1/4 PVC figure from the game/anime “Hyperdimension Neptunia” ( 超次元ゲイム・ネプテューヌ ). Will be released in October 2018. Around 470mm tall, 22,037 yen. From the anime series “Hyperdimension Neptunia” comes a 1/4th scale B-style figure of the guardian goddess of Planeptune, Neptune, in her transformed form – Purple Heart!